Tampa, Fla., August 11, 2016 – TeamViewer®, the global pioneer of remote control and online collaboration software today announced the availability of ITbrain Backup to provide simple, hassle-free and reliable endpoint data protection. With ITbrain Backup, users can securely backup their data and restore it remotely, in case of disaster. ITbrain Backup addresses the needs of managed service providers (MSPs) and small and medium businesses (SMBs) by providing the ability to regularly and automatically backup unlimited endpoints, ensuring that data stored locally is protected. With its centralized web restore, ITbrain Backup allows users to restore data through a web dashboard from offsite data centers located in Germany, USA and Asia. As it works with TeamViewer’s infrastructure, ITbrain Backup can be deployed using remote activation, making it easy to reach endpoints that are geographically dispersed. 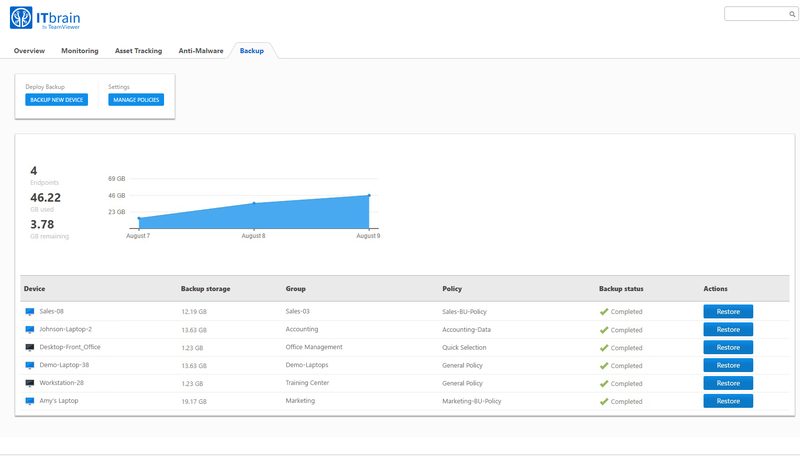 Once deployed, ITbrain Backup gives users the ability to choose backup policies based on their needs, as well as offering automatic deduplication, alerts for failed backups and scalability all on one intuitive interface. More information on ITbrain Backup is available at www.itbrain.com/en/services/backup/.